A lot of amateur astronomers tend to think of Earth’s Moon as a nuisance. It’s so bright that it interferes with observing, or imaging, faint deep sky objects like nebulae or far-away galaxies. However, maybe we should think of it a different way. Recently, Mars has been pretty close to Earth, and a lot of amateur astronomers (including me!) have been trying to peer through Earth’s atmospheric turbulence - as well as martian dust storms - in order to catch a fleeting glimpse of faint markings that represent some aspect or another of martian planetary geology. But, the Moon is right next door, it has no atmosphere, no dust storms - and it can be observed with the smallest of telescopes at any time of the year ! 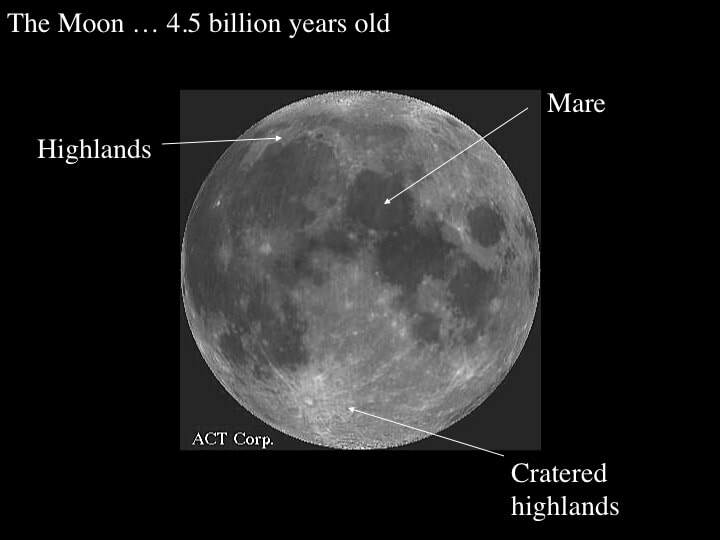 So, I’d like to take a look here at the geology of the Moon, and highlight some of the features that planetary geologists have used to decipher its history - and that can be easily observed by amateur astronomers. 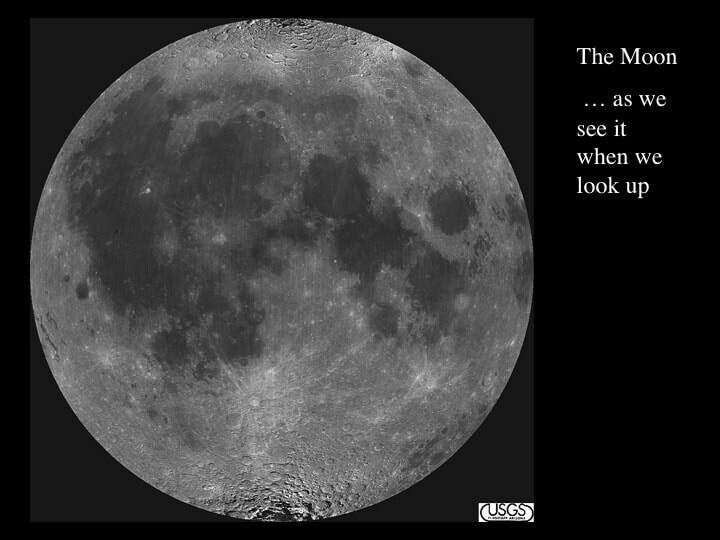 Because the Moon is so easy to observe, there’s an awful lot of things to say about it. Rather than trying to rush through things, I thought I would look at the basics first, placing the emphasis on things you can see yourselves. However, there’s a lot of other interesting stuff to consider once you’ve gone beyond the basics. For example, why does the other side of the Moon look so different to the side we know and love ? Believe me, it’s much more than a simple coincidence, but I thought I would deal with that in another presentation. Well, I guess you all know that the Moon is not made of green cheese ! However, like green cheese it is old ! It’s about as old as the Earth, that’s to say about 4.5 billion years. So, what exactly is it made of ? No surprise, it’s made of rock ! Even with the naked eye, you can easily see that the Moon is made of at least two different kinds of stuff : big patches of dark coloured rock called Mare, and light coloured rock that makes up the rest. Any telescope will show you that the dark Mare are flat like the Canadian Prairies - that’s why they were called Mare, which is latin for “sea” - while the light areas either form chains of mountains called Highlands (now there’s imagination for you ! ), or they are pockmarked with craters. 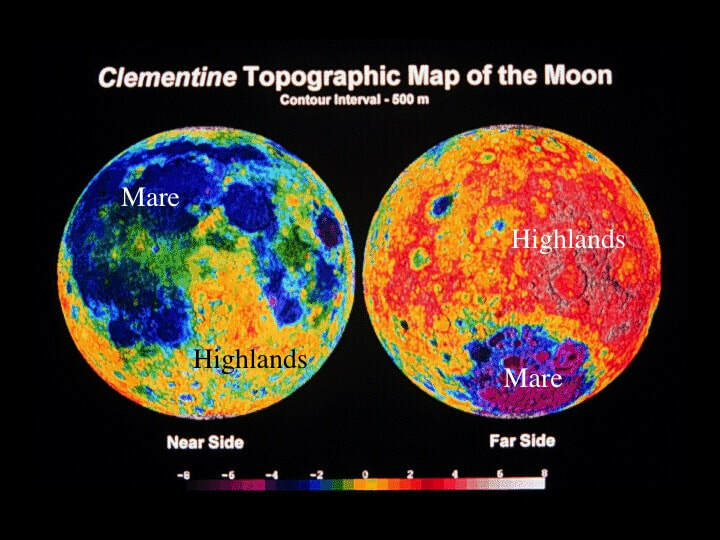 Here’s a topographic map of both sides of the Moon that highlights the distribution of the Mare versus the Highlands. So, what are these light and dark rocks made of ? The light stuff is really fascinating, not because its strange - there’s actually quite a bit of it on Earth, especially in Canada - but because there’s so much of it on the Moon. It’s called anorthosite, and it’s mostly made of one mineral called feldspar. This particular feldspar (plagioclase) is made of calcium, aluminium and silica, which - just to put things in perspective - is about the same composition as “Coffee-Mate”, the stuff some people put in coffee instead of milk, and - big surprise - it’s white or very light grey in colour. However, the really important thing is that this feldspar has a low density. In other words it’s very light! in terms of its weight. So, here’s our first planetary geology problem : the outer part of the Moon is called the crust (the same word that’s used to describe the outer part of our planet) and the Moon’s crust is about 70 km thick (that’s nearly twice as thick as the Earth’s crust). 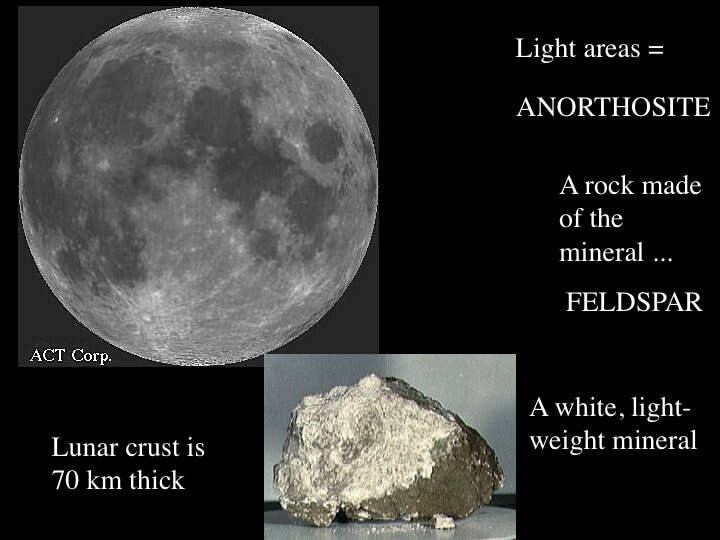 If the Moon’s crust is mostly made of feldspar, that’s a lot of lightweight material - much more than we find on Earth where the crust is a mix of heavy and lightweight minerals. So, the question is “why is the Moon’s crust so light?”. The fascination here is that there’s only one way to do this geologically. The outer part of the early Moon must have been completely molten : an ocean of molten rock that was several hundred km deep ! Crystals began to form in this magma ocean as it cooled down and, because crystals of feldspar are so light, they rose like a scum to the top of the ocean, while heavier crystals like olivine and pyroxene sank to the bottom. The heat needed to melt the outer part of the Moon probably came from energy released by the impacts of the material that collected together to make the Moon in the first place, so I’d better digress here and just remind you of the most popular theory of the Moon’s origin. lBasically, the chemical compositions of the Earth and Moon can be best explained if the Earth was struck by another planetary body about the size of Mars, very shortly after Earth had first formed. The Moon seems to have very little iron in it’s core, so the idea is that the outer part of the impactor and some of the outer part of the Earth were literally volatilised - and condensed as a ring system around the Earth, somewhat like Saturn’s rings, except that within a few 10’s of years, the ring system coalesced to form a spherical body that became our Moon. OK, back to the main story. After the Moon had formed, and the light stuff had floated to the top of the magma ocean to make the crust, the Moon continued to be bombarded by planetissimals and that left many of the scars we see on the lunar surface today. These scars are of two kinds : craters - here’s Clavius of 2001 fame - and Basins. 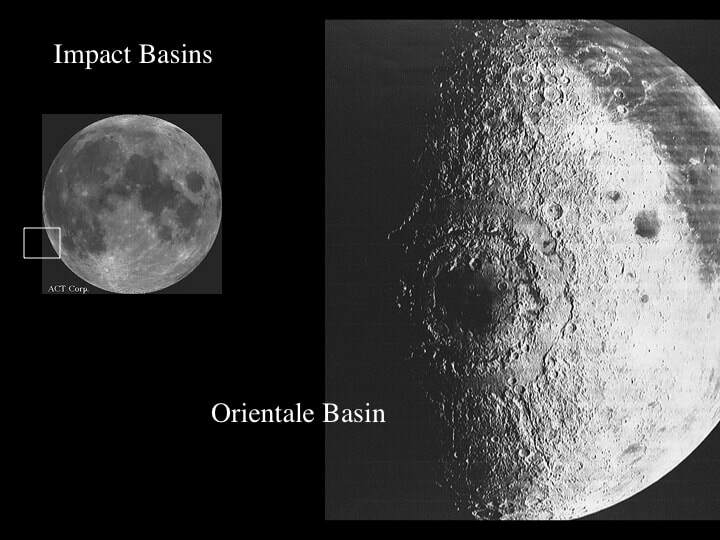 I’m going to focus on the Basins here because they are the key to understanding the difference between the Highlands and the lunar Mare. … and here’s the Mare Imbrium (or Imbrium Sea) that we can see from Earth. They look very different, don’t they ? Well, now we’re going to look at why. 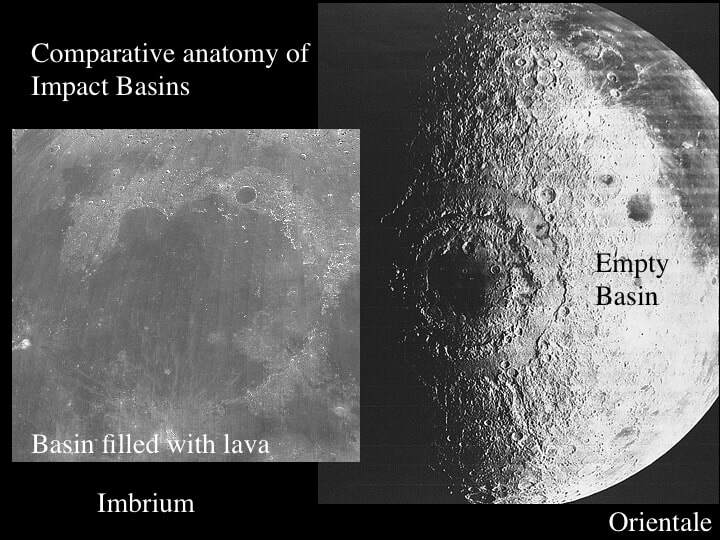 Lunar Basins are so big that planetary geologists have argued for quite a time about whether or not they could be the results of impacts, or whether they were the result of the internal geology of the Moon. 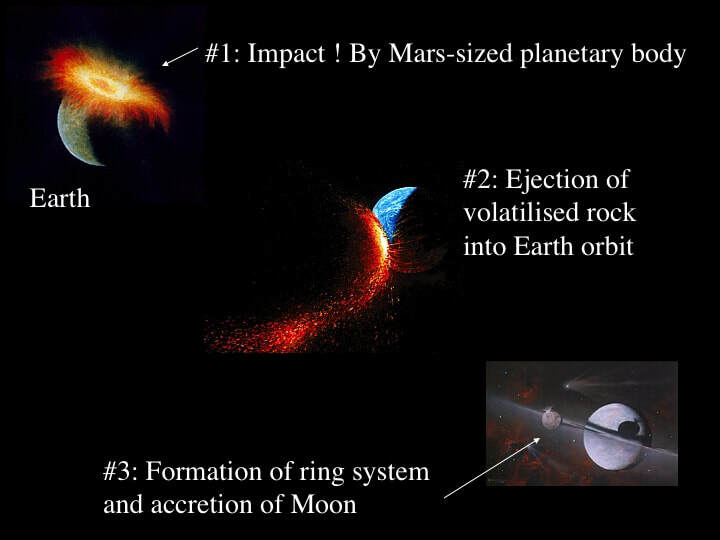 It turns out that they definitely formed from major impacts. 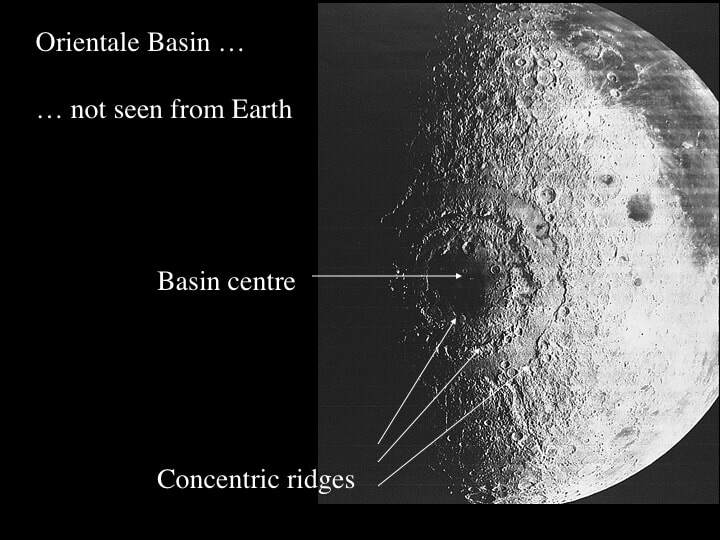 Take another look at the Orientale Basin (the one we can’t see from Earth) : notice the bull’s-eye shape and the concentric ridges around the centre. These ridges are circular mountains that formed when the force of the impact sent out shock waves that lifted and tilted the feldspar crust at the edges of the huge hole that formed when the stuff in the centre of the Basin was hurled out by the impact. 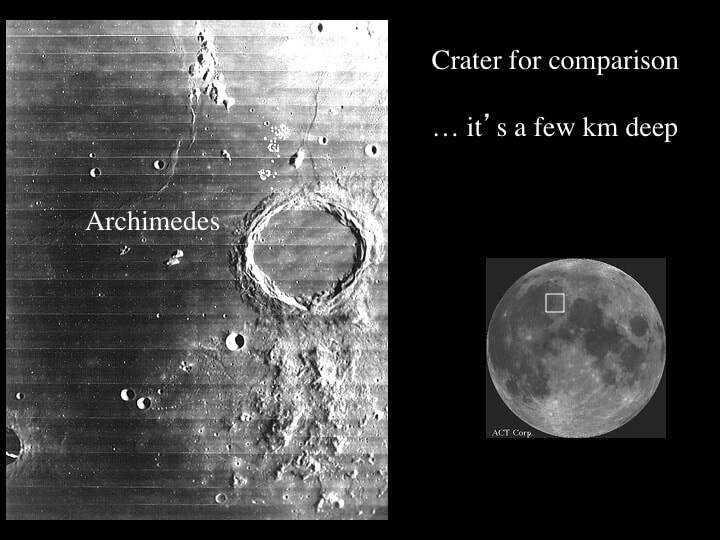 This picture of the crater Archimedes gives you an idea of what I mean, except that the size is much different : for example, the Basins would’ve been about 12 km deep - that’s deeper than the Himalaya is high ! According to theory, after a Basin had formed, the sides of the initial hole began to collapse inwards into the Basin, and that formed the outermost concentric ridge. If you now take a second look at the Mare Imbrium (the Sea of Rain), ignoring the dark stuff for the moment, you can see that the Carpathian, Apennine, Caucasus, Alps and Jura mountains form a nearly continuous arc of highlands, interpreted as the outer-most ridge that resulted from the impact that created the Imbrium Basin in the first place. If you use your imagination, lunar planetologists believe that the LaHire and Spitzbergen Mountains form the remnants of an inner ring of impact-related ridges. 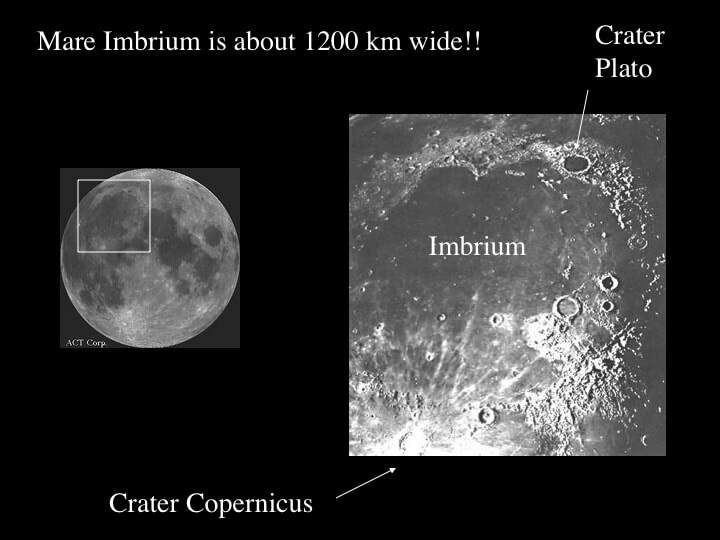 All of these first-order features of the Imbrium Basin can be clearly seen though a small telescope from any light-polluted backyard. Now … what about all this dark stuff that fills Mare like the Imbrium Sea ? You may already know the answer to this one, but I’d like to point out how you can see the evidence for yourselves. One of the first things I notice when I look at the Mare Imbrium is the large Bay on its NW side (Sinus Iridum). It looks like 2/3 of a crater whose SE side has been covered by the dark stuff that forms the floor of the Mare Imbrium itself. If you look very carefully down in the SE corner of Mare Imbrium, you can see the crater Wallace that shows exactly the same thing, but on a smaller scale. So what is this telling us ? it tells us that whatever the dark stuff is, it could flow like a fluid and cover things, fill holes, and drown ridges and hills. Well, it turns out that the dark stuff is made of lava - very similar to the lavas that make up the seabed of Earth’s oceans - called basalt. It’s dark because it’s made of dark minerals like pyroxene that are full of iron and magnesium, as well as silica. Basically, what happened is that the huge impact Basins like the Mare Imbrium were flooded by giant basalt eruptions that filled them up, but not quite to the brim : hence we can still see the Highlands poking out. If you look around at the rest of the near side, you’ll see that the Mare Serentitatis (or Sea of Serenity) and the Mare Crisium (or Sea of Crises) are very similar to what we’ve just looked at in the Mare Imbrium - but what about the other large patches of dark stuff ? Well, Mare Humorum, Mare Nectaris and Mare Fecundatis (Seas of Tears, Nectar and Fertility to you !) are somewhat similar to Imbrium, but have a more corroded look - because they are older and have probably been flooded with more lava. 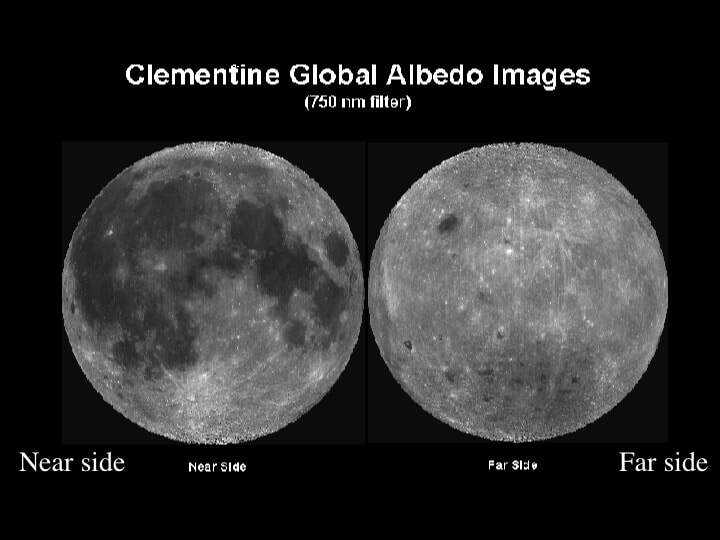 Now check out the Mare Nubium (Sea of Clouds) and the Sea of Tranquility. These are so old and have been flooded with so much lava that I can’t see any trace of their original circular Highland rims, but the professional planetary geologists tell us that they formed in the same way as the other Mare - as impact Basins that were later flooded by basalt lavas. So, when did these huge impact Basins get flooded ? 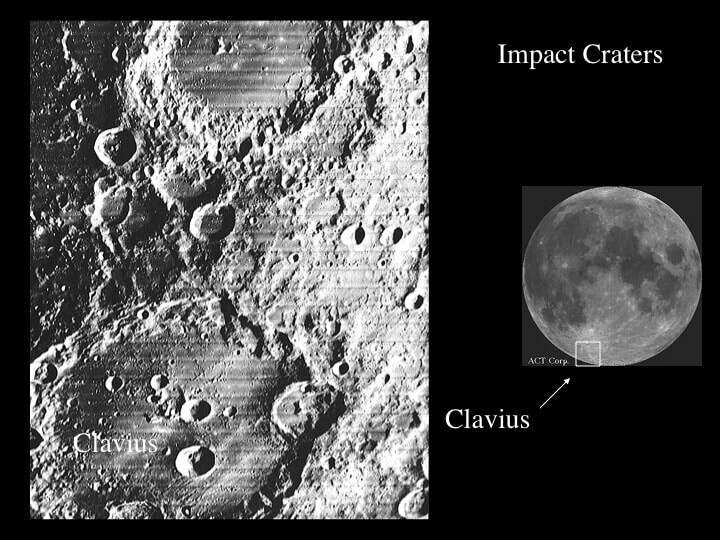 You might very reasonably suppose that it happened when the impactors punched huge holes in the lunar crust to make the Basins in the first place. Your logic would be impeccable, but you’d be wrong ! The basalt lavas didn’t erupt until much later. The impacts that formed the Basins occurred about 4 billion years ago, but the basalt lavas that filled the Basins to make the Mare didn’t erupt until about 3 billion years ago : a billion years later ! So, here’s the second planetary geology problem for you : "why did the lavas that filled the impact Basins erupt so much later ?". If you saw my presentation about Venus in August, you might be able to guess at a possible explanation. Like Venus, the Moon was always dry, therefore its inside was very stiff, even when it was warm. Hence, plate tectonics could not operate to enable the Moon to cool down. But, cool down from what? Well, from the heat that was gradually building up due to the radioactive breakdown of elements such as U and K. Just like Venus, that heat built up inside the Moon until melting began deep down at roughly 200-400 km below the surface - at about 3 billion years ago when the Moon was approximately 1.5 billion years old - and basalt magmas rose to the surface taking the heat with them. However, unlike Venus, because the Moon is relatively small, it didn’t contain very much in the way of radioactive material, so it didn’t manage to heat up enough to melt again after the Mare had formed. Basically it was a one shot deal. So, next time the Moon is up, and you can’t see your favourite nebulae or galaxies, take another look at the planetary geology of our nearest neighbour. You’ll be looking at the relics of a Moon-wide magma ocean and the scum that floated to its surface, giant impact structures that formed lunar basins, and the build-up of radioactive heat inside the Moon that led to melting and huge eruptions of lava that flooded the impact Basins and nearly buried the Highlands. 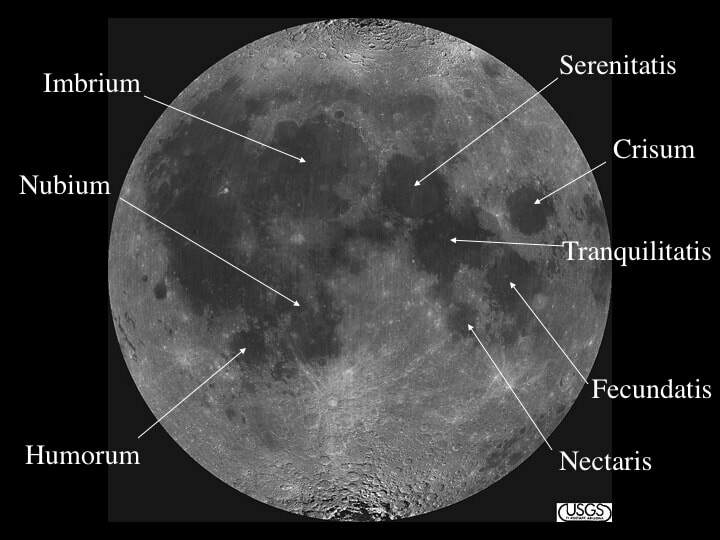 Next time, I’ll look at some other geological features we can see on the Moon through small telescopes that can tell you and other amateur astronomers about the processes that shaped the lunar surface as we see it today.